Imprisoned Harry Lomart is a vicious, brute of a man and yet he is prepared to do his long jail term as he is confident that on his release his beautiful wife Pat will be waiting for him, but a visit from Pat brings him his worst nightmare. During World War II in North Africa, a group of British commandos disguised in Italian soldiers must travel behind enemy lines and destroy a vital Nazi oil depot. In March 1914, a mining engineer named Richard Hannay (Robert Powell) tries to prevent Prussian Agents from executing a political assassination designed to trigger World War I.
Stephen 'Hannibal' Brooks: [on being told the war is over for him] Oh, thank God for that. I stumbled on this movie on a Sunday afternoon and, having nothing better to do, sat down to watch. 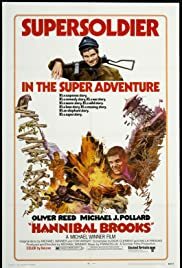 I wasn't expecting much--director Michael Winner doesn't have the strongest reputation--but this was a very well-done film. It has that 60s anti-establishment tone, though Oliver Reed's character is more indifferent to war than an outright rebel. When he is captured, Reed's character, Hannibal Brooks, volunteers to work at the Munich zoo and becomes the caretaker for the zoo's elephant, Lucy. When the German caretaker is killed in a bombing raid, Brooks is put in charge and directed to take the elephant to safety in Ausria. What follows is a series of largely comic misadventures, though the film does develop a serious tone as it goes on. Unable to take the elephant by train, Brooks sets off on foot, accompanied by two German guards and a female cook. There is some great German scenery in the film as Brooks and company make their way into the high country. Following the accidental death of one of the guards, plans change and the remaining trio make their way to Switzerland. There's a rogueish American escapee, played by Michael J. Pollard, who keeps crossing paths with Brooks, as well as a German officer, played by Wolfgang Preiss, whose path crosses Brooks' as well. Rather reluctantly, Brooks becomes something of a hero, though he's motivated more by his desire to keep Lucy safe than by anything else. A very enjoyable movie that I wouldn't mind seeing again some time.